Millets are one of the oldest food crop cultivated by man. Millets have much more calcium, protein, and iron than rice and wheat. These poor man’s grains are high in fiber, rich in minerals, low fat, and gluten free also. Millets are not just good for you but for the environment as well. Millets can grow in dry lands and even in poor soil quality. They need only one-fifth to one-tenth of the water that rice and wheat cultivation needs. As if these reasons werent enough, most millets are grown organically because they are naturally pest-resistant! Yet, a word of caution. Just as too much of anything is not good, consuming too much millets is also not good for health. All millets, in general, have giotrogenic effects and hence people with thyroid related problems need to be careful about how much millet can be included in their diet. Please consult your dietitian/doctor about this. Post World War 2, India experienced severe food scarcity. My mother still remembers having to modify their diet from the staple of rice to wheat and millets such as chama. 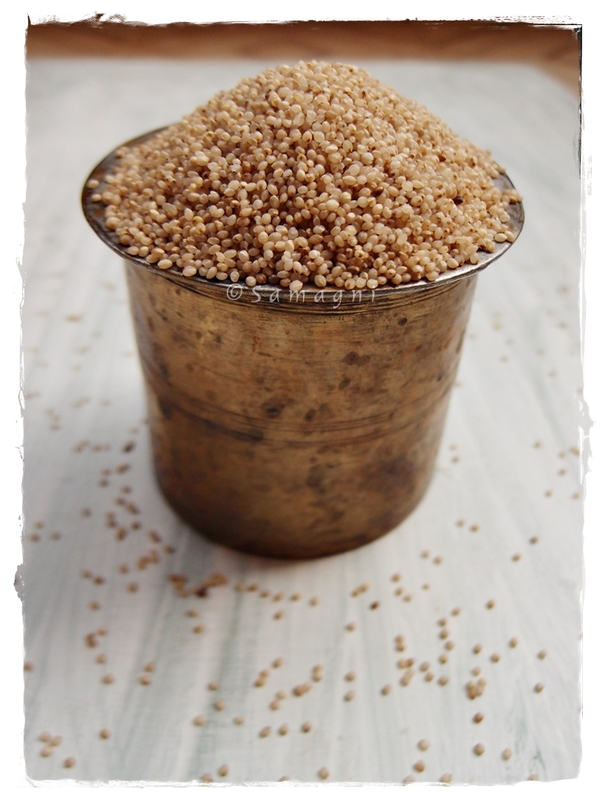 Little millet / Chama can be used to make nutritious and tasty idli / dosa. The below recipe makes soft and fluffy idlis that remain so even after 4-5 hours. Wash the millet in water, drain, and soak in water overnight or for 4 to 5 hours. Rinse, drain, and soak urad dal and 1½ teaspoon methi seeds together overnight or for 4 to 5 hours. Five minutes prior to the grinding time, soak the beaten rice flakes in 1/2 – 3/4 cup water. Drain the water from the soaked urad dal and methi seeds into a cup. Keep aside. You will need this while grinding. Add the soaked urad dal and methi seeds into a mixer jar or a wet grinder. Add small quantities of the drained water from the urad dal and blend to make a smooth paste. Remove into a large deep bowl and keep aside. Drain the water from the soaked millet. Discard the water. Add the soaked millet to the mixer/grinder. Add small quantities of water and grind to a smooth paste. Add soaked beaten rice flakes to this and grind well. Remove this mixture from the mixer and add this to the large deep bowl that contains the ground urad dal. Add adequate amount of salt. Use your right hand to mix the batter thoroughly. The batter should be neither too thin nor too thick. Cover the bowl with a lid and keep the batter aside in a warm area for fermenting (approximately 8 hours but this may vary depending on regional temperature) If you live in colder regions, keep the area at a warm place, near a warm stove or place it inside the oven that was pre-heated to about 50 deg C and leave it overnight with the oven light on. The next morning, the batter would have risen well. The next morning (or after 8 hours), stir the batter using a ladle and mix well. Use a cotton cloth to grease the idli molds with oil. Pour batter into each pit. Pour water into the steamer and gently lower the idli molds with batter into the steamer and close the lid. Steam for 12 to 15 minutes. Remove the idli mold from the steamer and place the molds on the kitchen counter for at least a minute. This is important. If you try to nudge the idlis out of the mold while it is piping hot, you will break them. After allowing the idlis in the mold to cool off for about a minute, use a sharp edged spoon dipped in water to nudge the idlis at the edges and gently remove them from the mold. Serve hot, soft, and fluffy idlis with chutney, sambar, or the Kerala style vegetable stew. 1. You can use the same batter to make crisp dosas also. You may need to add a little bit more water to the batter. 2. You can make idlis only on the first day of making the batter. If you refrigerate the batter and make idlis the next day also, you may not get the same soft and fluffy texture. The next day you may use the batter to make crisp dosas.